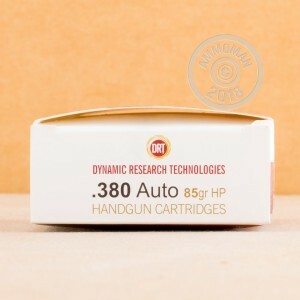 Dynamic Research Technologies frangible ammunition is designed for self-defense and training with the goal of minimizing ricochet or overpenetration risk. DRT bullets consist of a copper jacketed projectile with a powdered metal core that is highly compressed and fragments rapidly upon contact with a hard surface or an assailant. This process is slightly delayed to ensure an appropriate level of penetration in a self-defense situation. 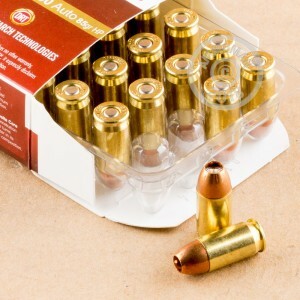 Each .380 ACP cartridge in this box of 20 fires a light 85 grain bullet at a muzzle velocity of 950 feet per second from a 2.75" barrel; this results in slightly reduced recoil, a notable benefit for those who find subcompact .380 Auto pistols too snappy for their liking.